The reason Rena ran aground on the Astrolabe Reef, near New Zealand, is still unknown but its damaging effects are becoming clearer every day. The cargo ship, owned by Costamare Inc., has spilled between 220 and 330 tons of oil since it hit the reef on October 5 and the ship remains in a compromised position. Environmental Minister Nick Smith called this the worst environmental disaster in New Zealand's history. Of the ship's other cargo, 70 crates have already fallen into the sea and those that remain on board are unstable enough to prevent salvage workers from boarding. The ship is leaning further every day and the weather is making the situation worse - Wednesday reported sixteen foot swells. If salvage workers cannot get onto the ship, they cannot stop it from spilling oil. Workers are effectively locked out, as if by a garage door or bullet proof glass, until the weather improves. Forecasts give a more optimistic view for Thursday, when the swells may be as low as six feet. The ship's captain, as yet unnamed to protect his safety, appeared in court today, where he faces penalties of up to 12,000 New Zealand dollars and 12 months in prison. He will appear in court again on October 19 and may face further charges. People want to know why he ran into a documented reef in calm weather - but so far he has not supplied an answer. Be that as it may, Maritime New Zealand commander Nick Quinn remains focused on cleaning up the oil. There is already a light oil coating on the beaches and some 200 birds are already dead. An additional 41 birds are being treated at a wildlife emergency center. This is expected to get worse in the coming days, as the ship's structural integrity weakens and it continues dumping oil into the sea. Eleven of the ship's crates contain other hazardous material, including ferrosilicon. An alloy of iron and silicon, it is flammable if it comes in contact with water. 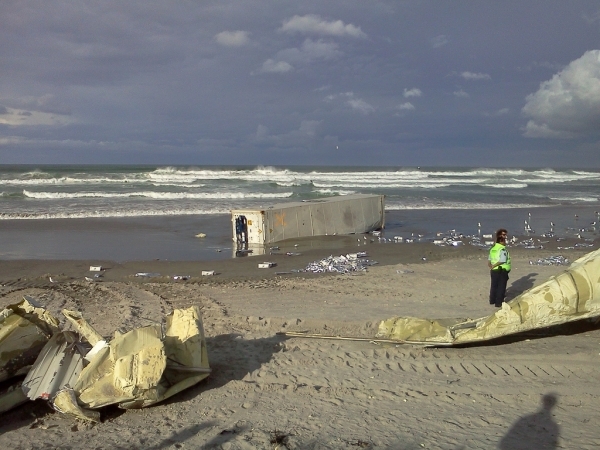 The swells buffeting the ship are expected to knock all of the crates overboard; there is a team of ships dedicated to rounding up these crates, but some have already washed ashore on Motiti Island, which lies between the reef and New Zealand's nearby Port Tauranga. Still, the biggest problem New Zealand faces right now is cleaning up the oil spill, a notoriously difficult process. Because no two oil spills are the same, the methods used to combat them are different too. The government is already drawing criticism for its delayed response to the oil spill; with 1400 tons of oil still on the ship which will likely end up in the ocean, they have to step up and take action before the crisis gets even worse.